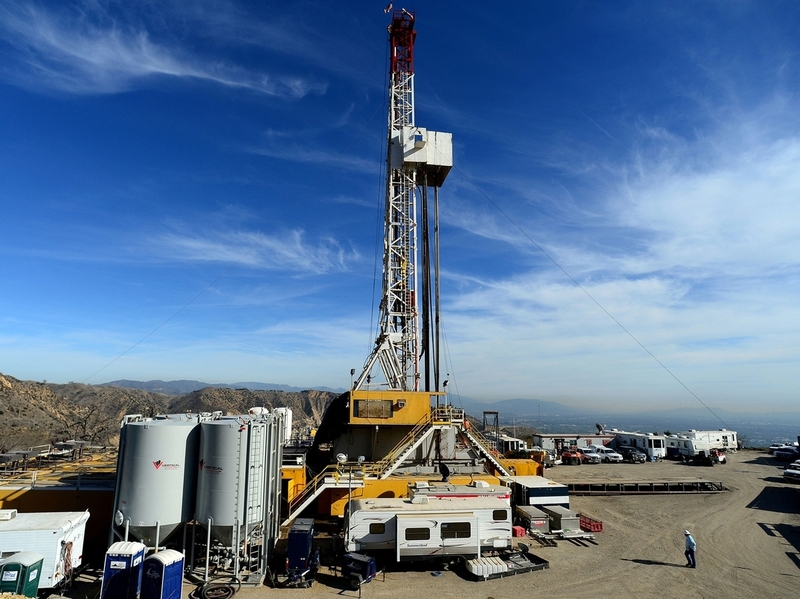 White House Report Calls For Safer Natural Gas Storage : The Two-Way The October 2015 leak at the Aliso Canyon plant in Los Angeles, which displaced 8,000 families, shows that U.S. gas storage infrastructure is old and requires improvement, say federal officials. Crews work to stop a gas leak at a relief well at the Aliso Canyon facility in Los Angeles in December 2015. A federal interagency task force has released dozens of pipeline safety recommendations to prevent another leak. The Obama administration is announcing a series of recommendations for ensuring the safety of the nation's more than 400 underground natural gas storage wells. The report comes as a result of the natural gas leak in Porter Ranch, a Los Angeles neighborhood, one year ago. It says the leak at the Aliso Canyon plant was the largest methane release from a natural gas storage facility in U.S. history. Some 8,000 families were displaced after complaining of headaches, nosebleeds and nausea. The facility operator, Southern California Gas Co., was unable to seal the well until February 2016, four months after the leak was detected. The report by a White House interagency task force includes 44 recommendations related to the integrity of gas storage wells, preparation for possible natural gas leaks, and better coordination between the gas and electric industries, which are increasingly interdependent. "No community should have to go through something like the Aliso Canyon leak again. The recommendations in this report outline the steps we can take to prevent such an incident in the future. Now, it is up to industry to implement these recommendations in a timely fashion," said Energy Secretary Ernest J. Moniz. One of the main recommendations is that natural gas operators should phase out "single-point-of-failure well designs" and introduce backup systems or "double-barrier protection" that can contain gas even in the event of a leak. "Approximately 80% of wells in the Nation's natural gas storage fields were completed in the 1970s or earlier. They have been exposed to decades of physical and mechanical stresses and pre-date many current materials and technology standards. In addition, many of these wells were converted to gas storage from oil production and may not have piping designed for the higher overall operating pressures of natural gas. Although rare, large natural gas storage leakage events can have negative impacts on human health and communities." Interim federal rules to ensure the safety of natural gas storage facilities will be released by the end of the year, said Marie Therese Dominguez, the chief of the Pipeline and Hazardous Materials Safety Administration, at a Washington news conference. As we reported in September, Southern California Gas Co. pleaded no contest to a single criminal charge that it failed to immediately report the Aliso Canyon leak to state emergency officials. The company paid a settlement of $4 million, most most of which will pay for the installation and maintenance of an infrared methane leak detection system that includes the hiring of six full-time monitors over the next three years. As The Associated Press reports, SoCal Gas still faces more than 130 pending lawsuits or civil or criminal penalties from a variety of government agencies.